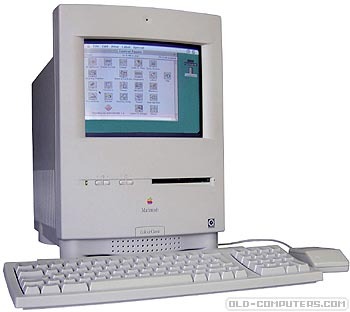 The Macintosh Color Classic (aka Performa 250) had same footprint as the original Macintosh. It was the first mac using a 10" (9" viewable) colour monitor (Sony CRT) and the last of the original all-in-one Macintosh line to be sold in the US market. Its main board had the same design as the Mac LC II, featuring a 16 MHz 68030 CPU. Sadly, its address bus was limited to 16 bit and allowed only 10 MB of maximum RAM. The Color Classic could emulate the Apple II thank to an expansion card inserted into its PDS slot. An improved version, called Color Classic II (aka Performa 275) was launched in late 1993 in Canada then in Japan. It had the same motherboard as the LC/Performa 550 with a 33 MHz CPU, a 32-bit bus and up to 36 MB of available RAM. Some people call the LC/Performa 550 the "Fat Color Classic II" because of the wider monitor. This machine's color graphics were *slow* so I usually ran mine in black and white mode. Yes, it made a major difference. There are PPC Upgrades available and this will make your Color Classic a lot faster so you could run Mac OS 8 or 9. OS9 would be a bit slow. But i think you can only run OS 9 on a Color Classic II. Special thanks to Jane Richardson who donated us this computer ! GRAPHIC MODES 512 x 384 dots. Could be expanded to 640 x 480 with significant hardware modifications. see more Apple Macintosh Color Classic Ebay auctions !